Buying a gun safe can be a big investment, but a necessary one if you wish to protect your firearms from theft, access by unauthorized users and even damage. This means that you want more than an expensive safe, or even one with the most bells and whistle. As with any investment the key is to get the most for your money and this is one by selecting a safe that provides the features you need without spending extra money on what you do not need. The following review will include four of the most popular designs in gun safes – large floor cabinet, wall, small cabinet and bedside. Each model provides the most bang for the buck. Each is a top choice in its respective design. Each is the best gun safe for the money. 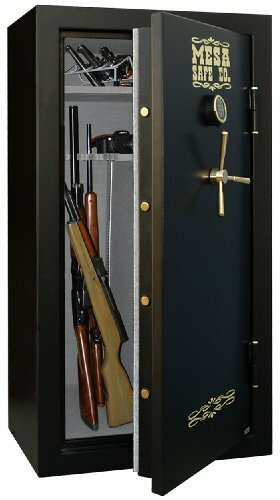 Large gun safes are really small vaults, as close as you can come to a personal vault without owning a bank. But if you are a serious collector, own a lot of firearms or have concerns about security this is what you need. 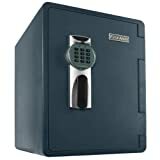 Of course these safes also cost more than other models so it is important you are getting the most for your money and that is what the Mesa provides. With 11/2” thick walls, multiple 1” diameter steel locking bolts and drill resistant locking mechanism security is not a question. Over 14 cubic feet of storage space and removable shelves you can configure this safe to hold a wide variety of firearms and lots of them. When it is time to access your guns you will be happy to see it is equipped with a battery powered electronic keypad and backup key. Finally, fire-rated at 1700 degrees for 1-hour means this safe can keep fire at bay as well. 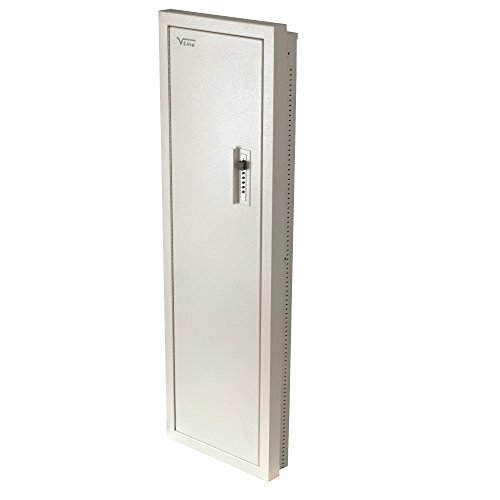 If you need to protect long guns and lots of them the Mesa 30 Gun Safe is the best for your money. Heavy weight means no one is walking off with this safe. Thick walls, heavy duty locking bolts and drill resistant locking mechanism provides top level security. Fire rating of 1700 degrees for 1 hour is more than enough o survive any house fire. Fully upholstered inside offers protection from dings or scratching. Not suited for small apartments of those who move often. Only negative ratings for this safe involve failure of electronic keypad. Some would be safe buyers are not in the market for a large, heavy floor safe; they either do not have the room or simply do not want a 600lb steel box in the room. The wall safe offers an excellent alternative – but due to the fact that it is mounted into the wall the commitment is high. This means you need to make sure your first purchase is the right one. Enter the V Line Closet Vault. Unlike many other models this safe is large enough to accommodate both long guns and handguns. Plus it is one of the most versatile wall safes on the market with adjustable shelves, door pegs, extra depth and a wide range of optional accessories available. The 14 gauge steel construction, 3 point locking mechanism and programmable simple lock will keep whatever you put inside safe from intruders or the curious. While this safe may cost more than some similar models it does provide you with more storage space, tougher construction and the ability to adapt it to both long guns & handguns. This is why this is the best wall safe for your money. 2” more depth than other models, higher storage capacity. Push button Simplex lock- no keys to loss or batteries to change. Able to be personalized with wide range of accessories. Able to be installed DIY. Does protrude from wall, making concealment difficult. Is not fire rated or waterproof. For those looking keep their handguns safe and secure but do not want a large floor model taking up more space than needed a small cabinet design is a good option. The First Alert 2092DF is one of the best options available. Constructed of steel, cement and ABS plastic this safe is a tiny vault complete with pry-resistant hinges and 4 heavy duty locking bolts. 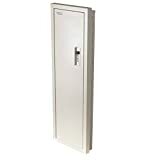 For added security the safe can be bolted down without voiding the warranty. With 1.31 cubic feet of storage, removable shelf and door pockets you will have ample space for a small collection of handguns. Plus, this is one of the only small safe with a fire rating of 1700 degrees for up to 1 hour AND it is waterproof even when fully submerged. When it comes time to access your firearms you will find the digital programmable keypad fast and easy to use, if accessing at night you will enjoy the backlighting too. Wheels and handle available for easy relocation. 5 year warranty, not voided when bolted down. Includes interior absorbent pad to protect against moisture. Digital lock has been reported as difficult to program. Self-locks after multiple unsuccessful attempts and cannot be opened for 15 minutes. 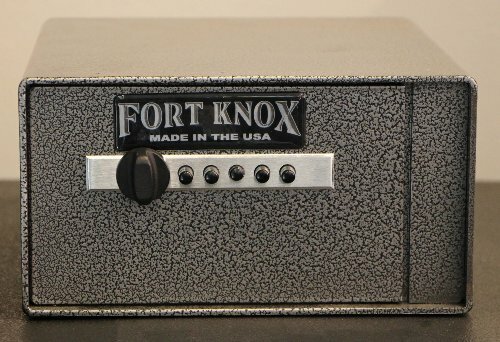 You may know Fort Knox for their full-size, custom vaults but they also make what maybe one of the most secure bedside pistol safes on the market. The P1 offers everything you need to protect your firearms close at hand without any of the unnecessary thrills that drive prize up. Constructed of heavy 10 gauge steel, topped with 3/16” thick wrap around lid this safe is nearly indestructible, solid and pry-proof. The simple push-button operating system in mechanical so there are no electronics to malfunction. The gas assist hinges make opening the heavy lid easy to do. The pre-drilled mounting points allow you to bolt it down to prevent being carried off. If you are looking to keep one or two handguns and extra magazines bedside this is the best safe for the money. Fail proof mechanical operating system. Heavy duty construction for maximum protection. Only weighs 21 lbs., mounting is necessary for full protection. Not the most attractive save available. There you have it – the best safes for your money in each of the most popular categories. If you are in the market for a new safe, or maybe your first safe, I think you will find one of these models to your liking. However, should you want to continue your search I encourage you to use our list as a comparison against which other models can be evaluated.